Those gorgeous warm days and the beauty of Renfrew Park draw old and young alike to enjoy nature and a step back in time. 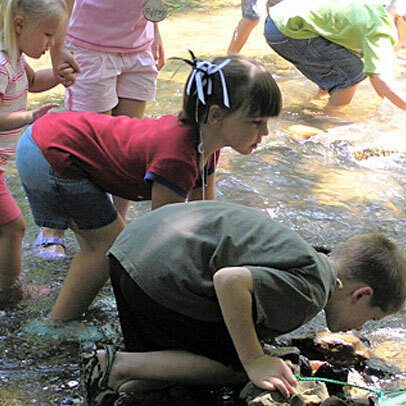 Summer Institute, with a variety of activities for children, is a great way for kids to enjoy the park while learning something new and exciting. Check back for details on Summer 2019. In 2018, Summer Institute offered programs for young nature lovers through grade 6, including Summer Stories, Nose to Nose with Nature, Down a Garden Path and Take a Hike. In addition, we offered a new craft workshop, Pin Loom Weaving, and a kids’ Pirate Party at the end of July. Check out the Summer Institute brochure with all the details. 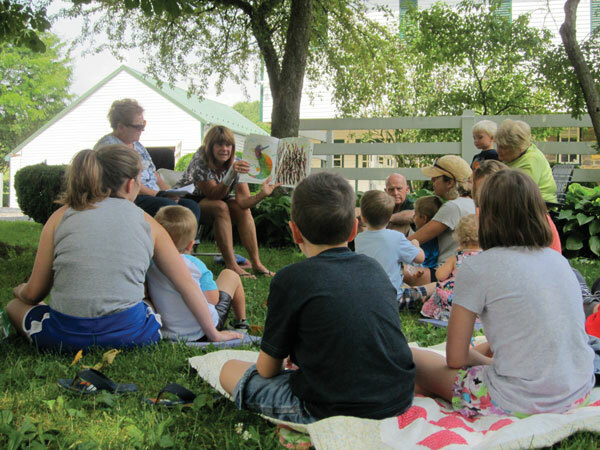 Renfrew Institute partners with the Alexander Hamilton Memorial Free Library and the Blue Ridge Summit Free Library in their Summer Reading Programs. Kids who attend a Renfrew Institute summer program receive a SECRET CODE to unlock points at the libraries! Prizes awarded to participants! Visit the library websites or call them for more information about their Summer Reading Programs. Alexander Hamilton library: (717) 762-3335 and Blue Ridge Summit library: (717) 794-2240. Call (717) 762-0373 or contact us by email at info@renfrewinstitute.org for more information about Summer Institute programs. Download our brochure for the full lineup of summer offerings for kids! 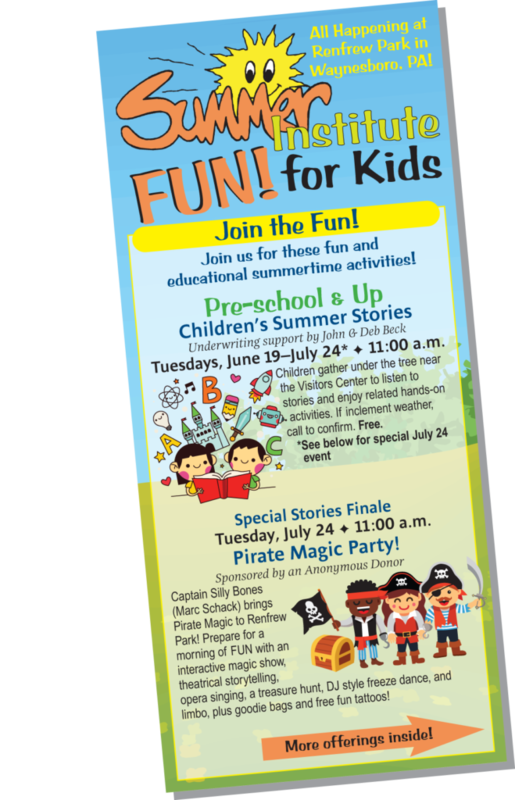 Tuesdays, June 19–July 24, 2018 • 11:00 a.m.
On July 24, kids are invited to a special event wrapping up this year’s Summer Stories. Captain Silly Bones (Marc Schack) brings Pirate Magic to Renfrew Park! Prepare for a morning of FUN with an interactive magic show, theatrical storytelling, opera singing, a treasure hunt, DJ style freeze dance, and limbo, plus goodie bags and free fun tattoos! See our Summer Stories Event Page here. Wednesdays, June 20 to July 25, 2018 • 9:30–11 a.m. Explore nature’s best spots with Renfrew Institute’s environmental instructors. Check out those weird, wild, wonderful creatures and plants that help make our life on earth possible. Tools, stories, secret missions, music, and games will add to the fun and adventure. Bring old sneakers for wading. Cost is $4 per child for members of Renfrew Institute, and $5 per child for non-members, per session. Attend one or more. Pre-registration not required. Meet at Visitors Center. Please arrive 15 minutes early to register. *Member discount for memberships of $25 or more. See our Nose to Nose Event Page here. Thursday, June 21, 2018 • 10:00 a.m.–2 p.m. Learn how to create your own colorful fabric with a pin loom. Materials include a 200-yard skein (your choice of colored yarn), personal loom, needle, and patterns for how to warp and weave. During the class we will complete one square, but the pattern shows ideas for further projects. Pre-register by June 15 so that materials can be gathered. Fee: $10 per child plus $20 materials fee. Limit 8. Students will keep their materials. We will have a lunch break, so bring your lunch. See the Pin Loom event page here. See our Take a Hike Event Page here. Step into the four-square garden with Renfrew Institute garden expert, Doris Goldman. Join in the fun as we harvest, plant seeds and discover ladybugs and other garden critters. Take home your own mini-garden and a garden craft, and learn to “make rain” with watering bells. We’ll water, dig, pick and play! Wear shoes and clothes that can get dirty. Cost is $4 per child for members of Renfrew Institute, and $5 per child for non-members. Pre-registration not required. Meet at Visitors Center. Please arrive 15 minutes early to register. See our Down a Garden Path Event Page here.